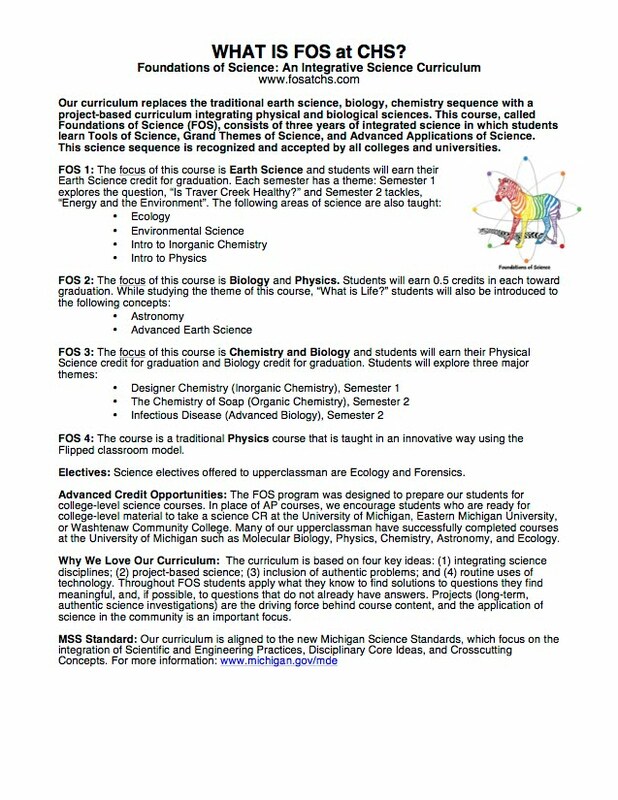 FOS 1 is the first course in the series of three integrated science courses offered at Community High. With an emphasis on Ecology and Earth Science, the FOS 1 curriculum has students explore the impact humans have on their environment in three major units. Unit 1: Is Traver Creek Healthy? Students do an in-depth, multidisciplinary study of a local tributary to the Huron River. They conduct three scientific assessments: Physical Parameters, Biological Indicators, and Water Chemistry. Students study the chemical concepts of water solubility, periodicity of elements and ionic reactions. 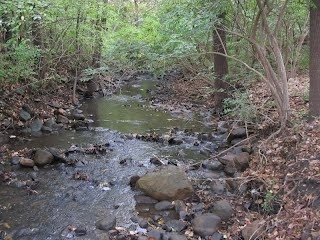 A wide range of ecological concepts including ecosystem dynamics, environmental justice, and the topography and land usage of the watershed are also studied. We also include a subunit that focuses on inorganic chemistry within this larger unit. Students study energy transfers involved in photosynthesis and cellular respiration, atmospheric chemistry and the long-term impact that humans have on the atmosphere, climate, and health of those affected. Students will research green technologies with a focus on engineering and reducing human-related environmental impact. Working in groups, students will then design a parcel of urban land within Ann Arbor using sustainable design techniques and alternative energies. These projects will be on display at Science, Arts and Letters Night for parents and friends to enjoy! Unit 3: Has Climate Changed in Ann Arbor? Focusing on the Ann Arbor area, students will look at glacial and topographical evidence to analyze evidence of past climatic change. Geology, glaciology, paleoclimatology and paleobiology are the main content areas. Students will construct topographic maps of local parks using Google Sketch-up, analyze the glacial landforms and topography of Ann Arbor, and compete in a geo-caching scavenger hunt around the City!